We have been super lucky to receive the best cast-iron pot ever as a wedding present and it is one of our treasured cooking tools. 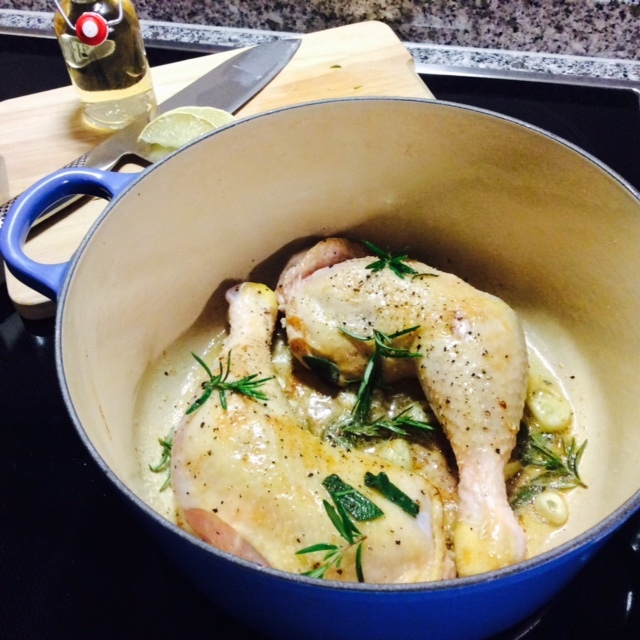 I can honestly vouch that Le Creuset is probably the best, especially for slow cooking. Do any of you have another favourite slow cooking pot? The recipe below requires a good pot or slow cooker and super fresh produce to get the maximum flavours out of each item. My way of knowing where fresh produce can be found is head to my local market and talk to the farmers and shop based on what the seasons have to offer! Add the olive oil in your pot and make sure your stove top is on medium heat. Add garlic. Then add the two chicken legs which have already been seasoned with salt. Once one side is golden turn them chicken around and add the juice of 1/2 lemon and some pepper. Let it sit for two minutes, then add sage, rosemary and wine. At this point you can turn your stove top to low, and let it cook until the chicken is moist and ready to be served. What I love to make as a side to this dish is sweet potatoes baked in coconut oil. The taste and smell is divine! Happy feasting !